. : Friends of Charnwood Forest - Home :. To work towards the preservation of the countryside and local environment of Charnwood Forest Regional Park for the benefit of those who live within it, for those who visit, and for future generations. Friends of Charnwood Forest is a society aiming to protect the natural beauty and amenities of the area known as Charnwood Forest. Membership is is open to all. More details about what we do and who we are can be found here. Our next event will be an outdoor event, a guided visit to the Gardens at Stoneywell on Thursday May 16th. We will have two parties, at 10:30 and 11:30. Price £9 (free to National Trust members). Numbers are limited; booking is essential. If you want to go, please contact Pauline Day, Telephone 0116 3264376, stating if you want the 10:30 or 11:30 slot, and giving your car registration number. If you are not a member of the National Trust please send a cheque (payable to Friends of Charnwood Forest) to Pauline at 251 Bradgate Road Anstey LE7 7FX. Memebrs will meet at the Stoneywell Car-Park on Priory Lane at the allocated time for the short minibus trip to Stoneywell. Please do NOT book direct with the National Trust. Our next indoor event will be a talk by Prebendary Canon John Woolmer of Newtown Linford on Monday May 20, entitled "The Butterflies of Charnwood Forest". John rediscovered a childhood interest in butterflies while teaching at Winchester College. He has combined this interest with his wife Jane&apos;s photographic skills to photograph butterflies in many parts of the world, and has published widely, notably in his book The Grand Surprise. Woodhouse Eaves Village Hall, 50 Main Street, Woodhouse Eaves, LE12 8RZ at 19:30. Members free; guests £3 payable on the door. 2019 Subscriptions are now due. Please complete a Renewal Form and return to our Hon Treasurer with your cheque as indicated on the form. Thank you if you have already paid. We hope that you will continue to support the activities of The Friends of Charnwood Forest in 2019. We have a full programme of events to look forward to. Please ensure we have your current email address for mailings from us. If we have an email address for you then Friends of Charnwood Forest will have sent emails to you about recent activities and membership renewal. Our new Membership Secretary is Felicity Manning. Your email address will be used to distribute information to members about our activities during the year. We have moved over to "Mailchimp" to distribute information to members; this means that your mail address will be held by "Mailchimp" in a database. To ensure Friends of Charnwood Forest emails reach your inbox, you may need to add mem@focf.org.uk (Friends of Charnwood Forest) to your Contacts or Safe Senders list on your system. If you are not getting email messages from us then this suggests that we may have an obsolete or incorrect email address for you. Please send the correct email address to Felicity Manning, our new Membership Secretary. Newtown Linford Parish Council arranged to get a large dead tree stump on Bradgate Hill, Newtown Linford, carved into a "Stag's Head", and this is now complete. We provided a significant contribution towards the cost. This will be the last Newsletter, as we have decided to discontinue producing the Newsletter. TIn 2016 we provided new information boards at the Leicestershire and Rutland Wildlife Trust reserve sites at Charnwood Lodge and Lea Meadows. Many members will remember that we visited Charnwood Lodge in 2015, and Lea Meadows in 2012. The information boards include our logo and some information about the Friends. We have also provided a noticeboard, including a map of Charnwood Forest, outside the Village Hall in Woodhouse Eaves. The National Forest Company applied ("The Chronicles of Charnia") to the Heritage Lottery Fund for a £3M grant to enhance the National Forest. Here are details of the application . The Application stated "The Chronicles of Charnia" will celebrate the area's internationally important volcanic legacy. It will enable and encourage people to explore its rich landscape and diverse heritage. It will provide deeper engagement for residents and visitors, while contributing to the local economy. It will coordinate management at a landscape-scale to make Charnwood&apos;s heritage more resilient to growing pressures. Most importantly, it will create a greater sense of local pride, inspiring communities to restore the character of this special place". It has a strap-line "Made by volcanoes, shaped by people". In early November (2017) we heard that the application was successful. And here are two Powerpoint presentations from a recent Stakeholder Workshop: an introduction and an update. Details of future meetings, social events, outdoor visits, etc. of Friends of Charnwood Forest is available here. Here are details of some of our previous events, which includes some photographs from our 25th Anniversary Party. 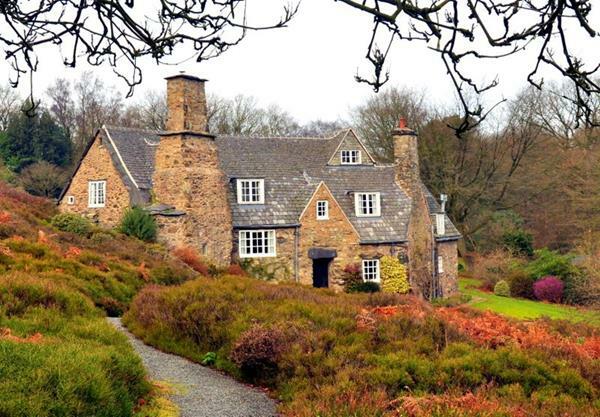 The National Trust's only property in Leicestershire, Stoneywell, lies a couple of miles north-west of Newtown Linford. Its official opening was on 11 March, 2015. Booking is essential; please telephone 01530 248040 or email Stoneywell@nationaltrust.org.uk. The Stoneywell website is at http://www.nationaltrust.org.uk/stoneywell/. We welcome all visitors to indoor events: most outddoor events are limited to members. Those wishing to join the Friends should download and complete the Membership Application Form. An interesting 20 minute amateur video of Charnwood Forest has been produced by Patrick Leach, Bob Morgan and Martin Roy and is available here. Please note that FOCF is not responsible for the content of this video. There are some Newsletters missing from the above list: if any member can help complete the list, please contact the webmaster. Copyright © 2012 Friends of Charnwood Forest. All Rights Reserved. Page last updated by PTM on 18 April 2019. If you have any comments, please email the webmaster. Web design by JSwift.